William John Campbell was the eldest of the seven children of Donald George Campbell (1873-1944) originally of Pembroke, and Caroline Kate née Treasure, known as Kate (b1868) of Yeovil. Donald and Kate were married in Yeovil in 1897 but had moved to Aldershot by the time of William's birth and, as far as I can ascertain, never returned to Yeovil. By 1911 the family were living in HM Prison, Princeton, Devon, where Donald was an Assistant Warder of HM Convict Services. He is known to have enlisted at Devonport in the 2/5th (Territorial) Battalion of the Gloucestershire Regiment. His Service Number 38384 in this regiment suggesting he enlisted in late 1916 or early 1917, when he would have been eighteen. The regiment was part of 145th Brigade, 48th (South Midland) Division. 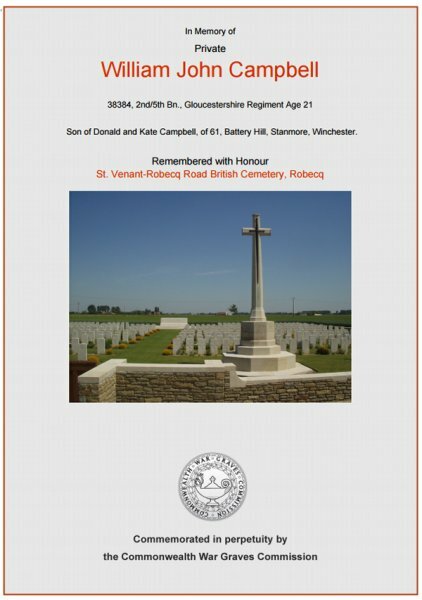 William was interred in St. Venant-Robecq Road British Cemetery, Pas de Calais, France - Grave IV.F.12. His name is inscribed in the County of Somerset Book of Remembrance in St Martin’s Chapel, Wells Cathedral and, bearing in mind his only connection with Yeovil is that his mum was born and married here, his name is recorded on the War Memorial in the Borough. The Commonwealth War Graves Commission certificate in memory of William Campbell.